You can now find on Amazon.com the executive summary of my book about Google Ads (AdWords) optimization methodology. 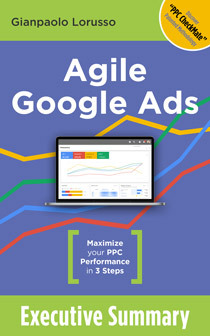 The title of the book is related to my way of conceiving Google Ads campaigns, that is: “maximum result with minimum effort (both economic and in time management)”. The constant confrontation with models as complex as ineffective, proposed by the various “gurus” on duty, pushed me to ideate and patent in the United States a method of control and optimization of account’s performance (“PPC CheckMate”) based on objective measurement factors, regardless the structure given to campaigns.